Some call it casserole, some call it a throw-together. In the Northland, where we’re from, we call them Hotdish. In Minnesota, the Dakotas, Wisconsin and Iowa, you can find these delectable dishes in small-town church basements, homes, and even some high-end restaurants. 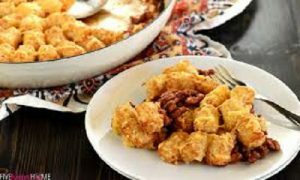 Each one contains a combination of some of your favorite items, and the Jumbo’s Tater Tot Hotdish is no exception. Make it for your family tonight, and your family will have a new favorite. Place half of the tater tots in a single layer in the bottom of the baking dish. Pour Sloppy Joe Mixture on top. Top with 1 coup of cheddar cheese, then remaining tater tots, then remaining 1 cup of cheese. Bake 45 to 55 minutes or until hotdish is bubbly and potatoes are lightly browned.